Eight species of Podocarpaceae foliage are recognised from the late Oligocene or early Miocene Newvale site, South Island, New Zealand, and the following five new species are described: two of Dacrydium Lamb. and one each of Dacrycarpus (Endl.) de Laub., Phyllocladus Rich. ex Mirb. and Halocarpus Quinn. The latter is the first macrofossil record of this New Zealand endemic genus. All these conifers, plus Agathis Salisb., Microcachrys Hook.f. and Podocarpus Pers., co-occurred in the local vegetation at Newvale. 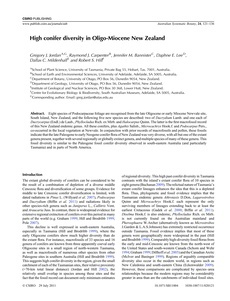 In conjunction with prior records of macrofossils and pollen, these fossils indicate that the late Paleogene to early Neogene conifer flora of New Zealand was very diverse, with all but one of the extant genera present, together with several regionally or globally extinct genera, and multiple species of many of these genera. This fossil diversity is similar to the Paleogene fossil conifer diversity observed in south-eastern Australia (and particularly Tasmania) and in parts of North America.